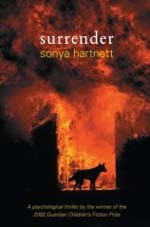 I honestly don’t know what to make of Sonya Hartnett’s YA novel, Surrender, except to say that days after I finished it, I am still thinking about it. I am dying: it’s a beautiful word. Like the long slow sigh of a cello: dying. But the sound of it is the only beautiful thing about it. Meet Anwell. He’s 20 and some unnamed disease (some degenerative disease or cancer, maybe) is eating him up, slowly and painfully. Confined to a bed, tended to by his Aunt Sarah, he is spending his final days on earth remembering all the days that came before. Hartnett’s novel is not a straightforward tale. I am a pretty proficient reader and sometimes I really felt lost in the story. I definitely felt lost in the prose, which is beautiful. Breathing is an undertaking: it takes minutes to sigh. My ribcage is the hull of a wrecked and submerged ship. My arms, thin as adders, are leaden as dropped boughs. the mattress, my closest friend, has been carved by the flesh of my unfleshed bones into a landscape of dents. The soul might rise, but the body pulls down, accepting the inevitable, returning to where it began. Anwell – or Gabriel as he is called by his closest (only) friend, Finnigan, lives in a scrubby community somewhere in rural Australia. His father, a lawyer is distant; his mother is frail. Neither of them pay very much attention to Anwell. Anwell had an older brother, Vernon, but he’s dead now. Anwell is responsible. And this is where the story gets tricky. I have a theory abut the book, but despite having read several reviews I haven’t found anyone else who might share it. I actually don’t think that Finnigan is real. I think the fact that Anwell killed his brother damaged him irrevocably. The further the book went along, the more convinced I was that Anwell had suffered from sort of psychic break and that Finnigan was a manifestation of a sick mind. Whether I am right or wrong, though, does not detract from Hartnett’s vivid, poetic prose, or the novel’s heartbreaking conclusion.